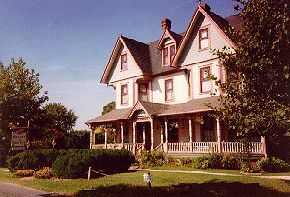 This charming 1802 Victorian Bed & Breakfast Inn with beautiful gingerbread trim, is just minutes from the islands of Chincoteague and Assateague where you'll find a beautiful, quiet beach and a wonderful wildlife refuge rich in waterfowl and the famous wild ponies. Also nearby you'll find fishing, golf, hiking, biking, canoeing and antiquing. The Bed and Breakfast has large romantic rooms with luxurious linens, antiques, fresh flowers, complimentary robes, oriental rugs and some with stained glass windows. Each room has a private bath, some with whirlpools, TV's, refrigerators and fireplaces all with air conditioning. Chef/owner Tom creates masterpiece meals to savor in our intimate candlelight dining room. Enjoy afternoon refreshments or a hearty full breakfast while listening to the fountains on the garden patio or porch. Enjoy evening cruises on the Bay or River. Outdoor heated pool. Pets Welcome! This and other Chincoteague Bed and Breakfast Inns can be found here in The Register.